So long, drought. Goodbye, weak Brazilian real. Sabesp's earnings were what investors were hoping for after years of troubles. Companhia de Saneamento Basico do Estado de Sao Paulo (NYSE:SBS) -- more commonly known as Sabesp -- ended 2016 on a strong note. The two issues that plagued it in prior years, drought and currency devaluation, eased throughout the year, and consequently the company posted the best net income result since its IPO back in 2012. Here's a quick look at the company's results and what Sabesp has planned for the coming years. Results are in millions and converted to U.S. currency at a rate of 1 USD = 3.1 BRL. Data source: Sabesp quarterly earnings release. 2016 was a year in which Sabesp experienced a significant turnaround in its fortunes. 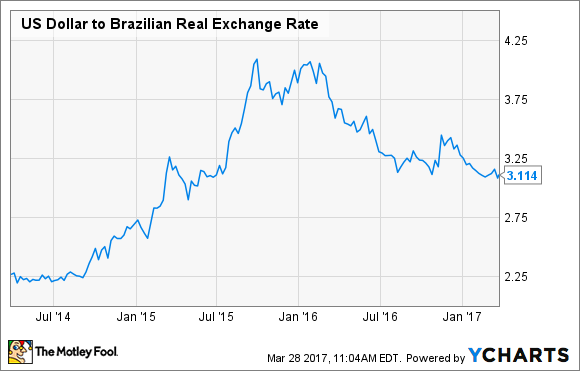 Throughout 2015, the Brazilian real lost value to almost all other currencies, especially the U.S. dollar. The strength of the real is critical to Sabesp operations because 47% of the company's debt is denominated in U.S. dollars or Japanese yen. Since its entire business is local, that means all revenue is in reais, but a decent amount of interest payments are in foreign currencies. If that wasn't enough, the Brazilian state of Sao Paolo was in the middle of a massive drought that led to lower billed volumes. Sabesp was even forced to offer bill credits for customers who would lower their water consumption, which resulted in incredibly low revenue rates. US Dollar to Brazilian Real Exchange Rate data by YCharts. In 2016, though, the real strengthened and rain returned to the region and replenished much of Sabesp's reservoirs, leading to significant increases in total volumes consumed. Also, drought relief allowed the company to do away with the water conservation credits. As a result, total revenue for the year increased 20%. Water and wastewater treatment has a lot of fixed costs, so the boost in revenue flows right to the bottom line. Also, the appreciation of the real against the U.S. dollar and the yen reduced financial expenses by 23% for the year. All of these factors helped in boosting 2016 net income 449% higher than 2015. Total volume billed for water and sewer increased 5.7% and 5.2%, respectively, compared to the prior year, from a combination of higher volumes consumed per customer and additional water and sewer connections to the Sabesp system. At the end of 2016, Sabesp's coverage rates of the Sao Paolo region for water and sewer were 100% and 87%, respectively. Sabesp's lowered its collection and treatment goal of 95% by 2020 to 93% collection and 83% treatment by 2021. The change has to do with faster-than-anticipated population growth in the region. Water inflows in 2016 were 27% higher than in 2015. Those higher inflows, combined with lower consumption from customers, led to a 44% increase in total available volumes in Sabesp's reservoirs. At the end of the year, net debt to adjusted EBITDA was a respectable 2.2. Sabesp's dividend is fixed at a payout ratio of 27.9% of net income. So 2016's dividend came to $0.38 based on the current exchange rate. That makes for a current dividend yield of 3.7%. Drought relief and a stronger real couldn't come at a better time, because Sabesp is still in the middle of a major spending plan. The company expects to spend $4.4 billion between now and 2021 to keep pace with growing population and to improve its coverage metric for sewage connections. Management expects it can fund 59% of that capital budget with internally generated cash flows, but it will need to take on additional debt to get it done. Hopefully, 2017 will be a much more typical operating environment for Sabesp. Yes, foreign currency fluctuations will continue to be an issue for some time, but management is slowly shifting its debts to be denominated in reais. Barring any slip back into drought conditions -- not likely since 2016-2017 rainfall has been within historical averages -- Sabesp looks to be on the path to a much more stable, profitable future.